Alpine, Angora, and Nubian kids, 6-8 months old and weighing 15-25 kg were grazed on high quality (wheat) or low quality pasture (dormant bermudagrass) for 54 d to evaluate breed differences and metabolic responses. Each kid on the bermudagrass pasture also received daily 200 g of a 24% CP supplement to stimulate intake. Wheat pature had an in vitro organic matter digestibility (IVOMD) of 78 vs 35% for the bermuda pasture. Goats gained 50 g/d on wheat pasture vs 10 g/d on bermuda pasture (P < 0.02). Angora kids gain the least ewight on bermuda (-8 g/d; P < 0.05) and most on wheat pasture (62 g/d; P < 0.05). Mohair production was greater for Angora goats on wheat pasture compared to those on bermuda pastures (9.9 vs 6.2 g/100 cm2; P < 0.05). 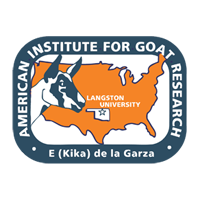 Angora goats on bermuda pastures had elevated levels of NEFA and plasma ammonia, and reduced levels of plasma urea N, consistent with catabolism of body tissue stores. Angora goats tended to have lower concentration of rumen VFA and ammonia. Angora goats apear to be more sensitive to inanition as compared to Alpine and Nubian goats. Presumably, their obligate nutrient requirements for hair production limits their ability to adapt, making them more vulnerable to nutritional stress.